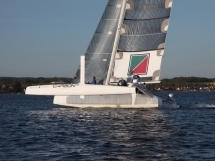 She has only sailed one race in 2013 and has been stored on land 2014. 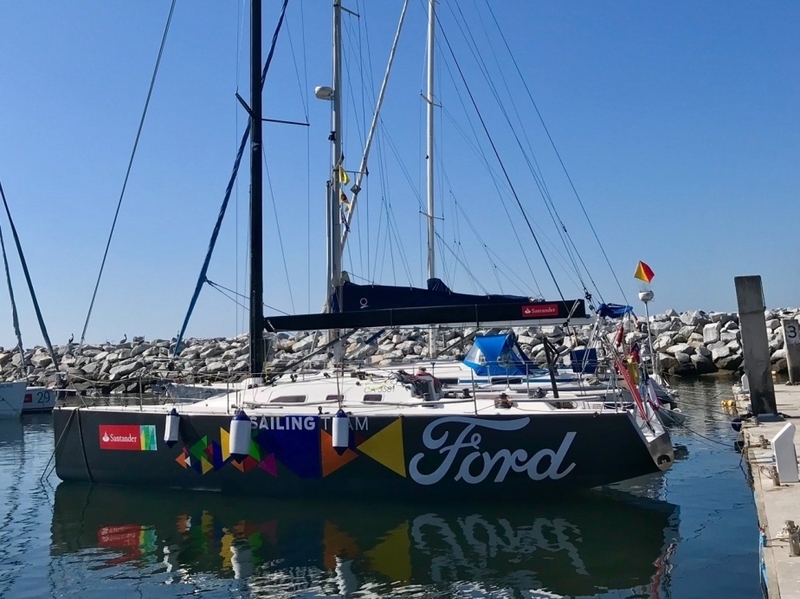 She is complete and ready for racing! 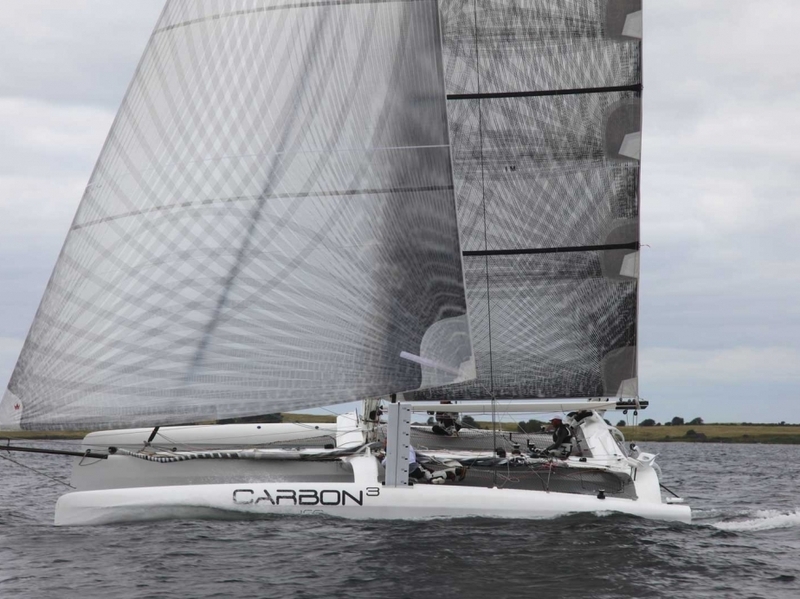 Danish Carbon fiber specialist. 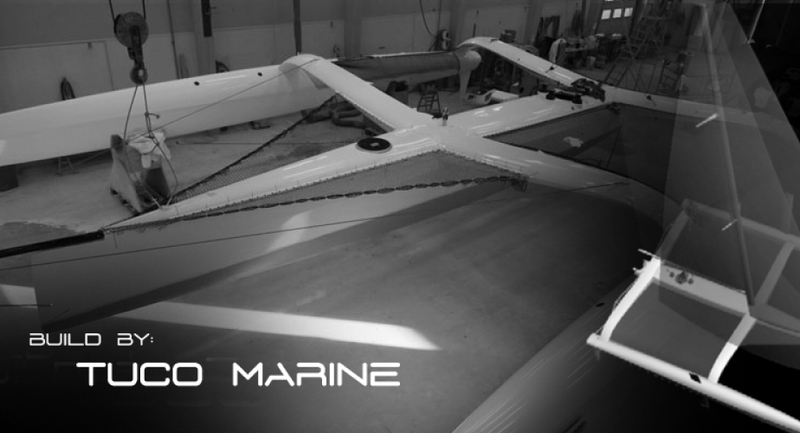 Tuco Marine Group have also build 3 passenger Catamaran ferries for Bergen, Norway in strong, light weight Carbon. 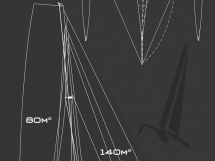 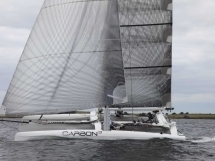 "Reconciling the requirement for interior space with that high performance is the almost impossible task that usually faces multihulls designeres, so Benoit Cabaret, and I were pleased to be asked to produce a 40 footer with 'absolutely nothing' inside. 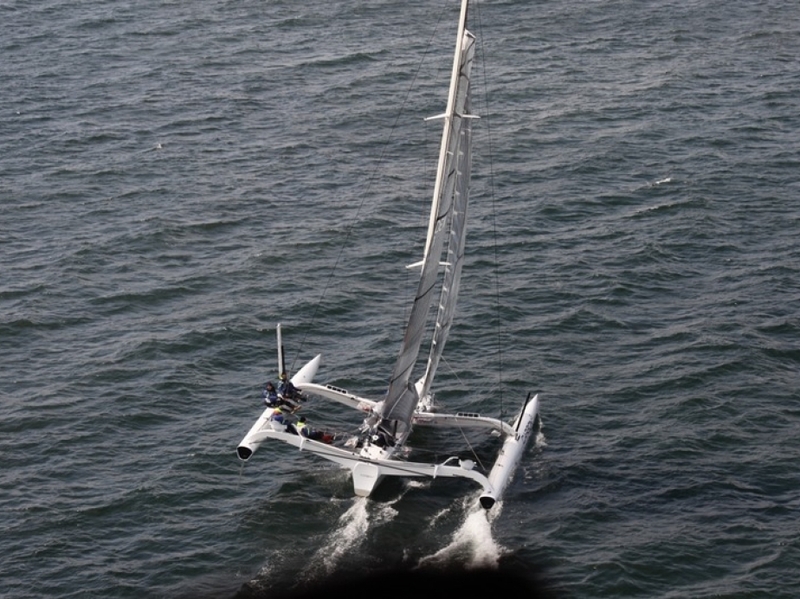 The simple brief was to draw a flat-out trimaran with the potential to match anything else of this size afloat - both inshore and offshore. 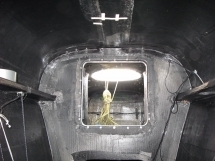 Our aim has been to address this brief by drawing an equally simple boat - with a view to keeping both weight and cost under control. Clearly rejecting the option to make the boat demountable or foldableis a good way to help achieve these two objectives. 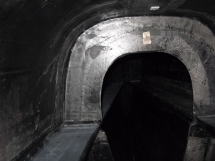 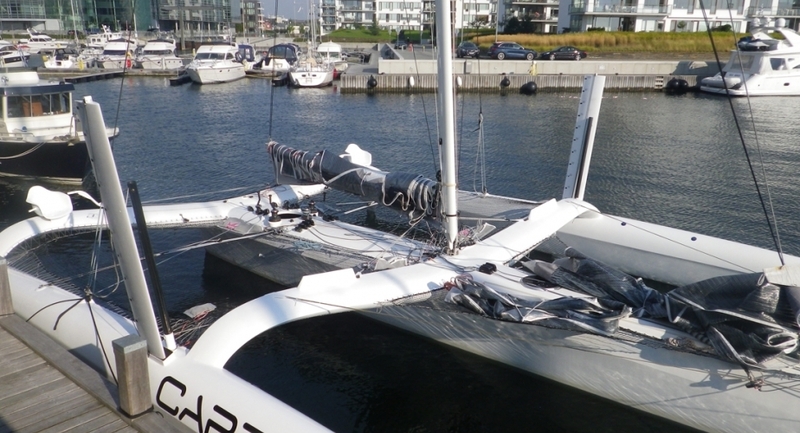 THe two beam are straight in plan view, as opposed to being swept forward as is common on larger trimarans. 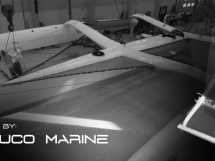 The layout of the boat has been optimised for the rig, which has been breathed on by multihull guru Torbjörn Linderson (backed by Marstrom) who brings his huge experience to the project. 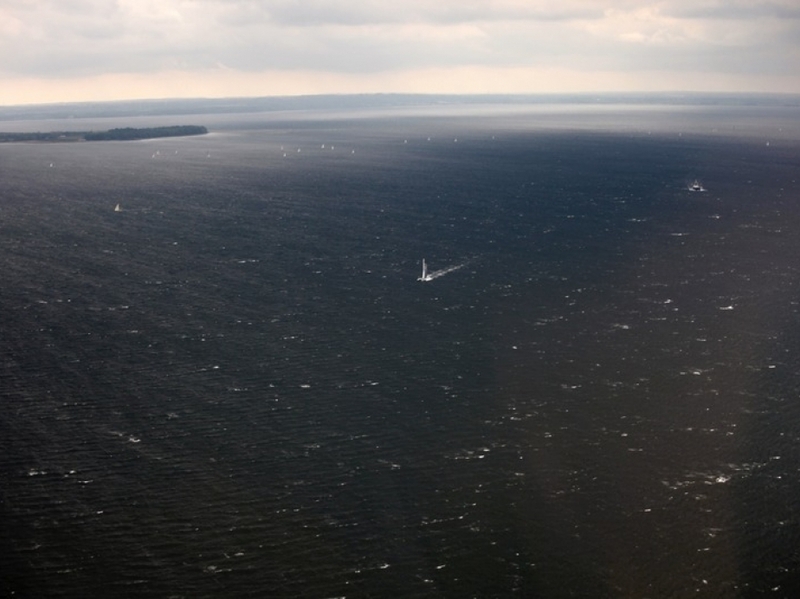 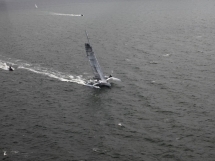 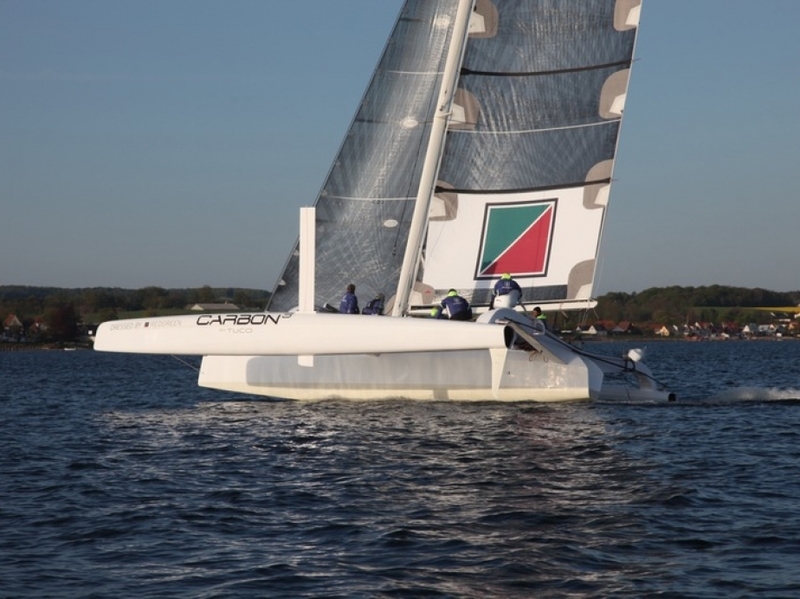 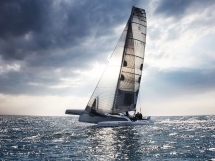 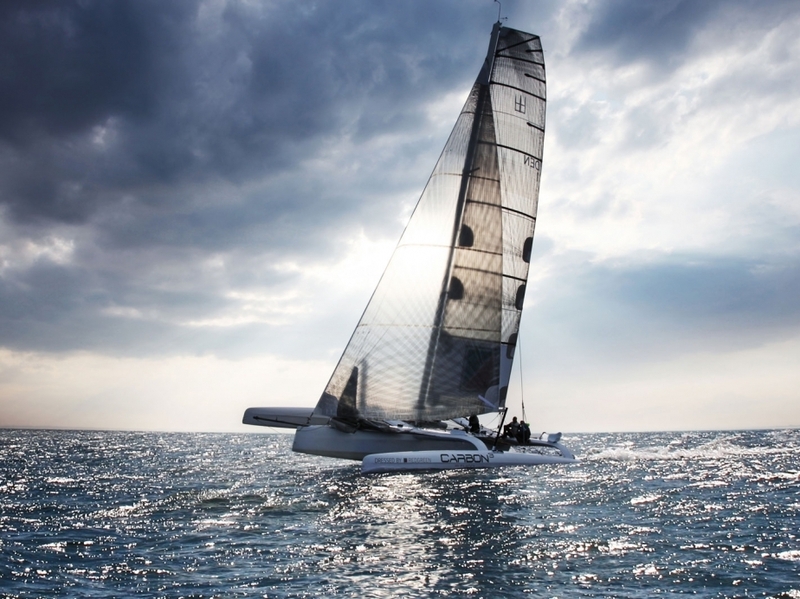 John Levell, whose structural engineering got Ellen MacArthur, Francis Joyon and Thomas Coville safely around the world, has been responsible for the structual design of this boat form the beginning of the project." 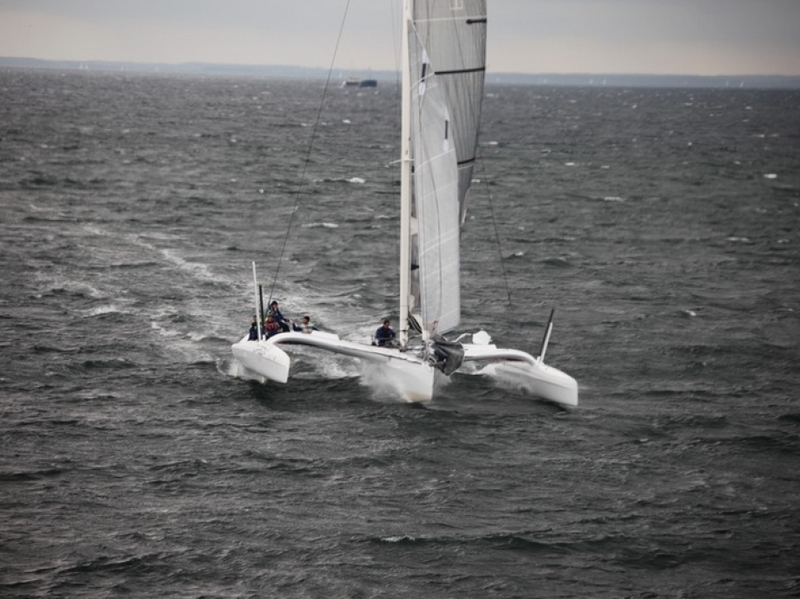 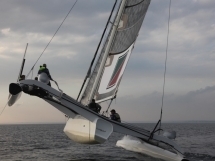 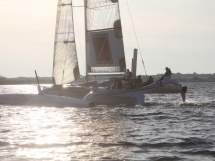 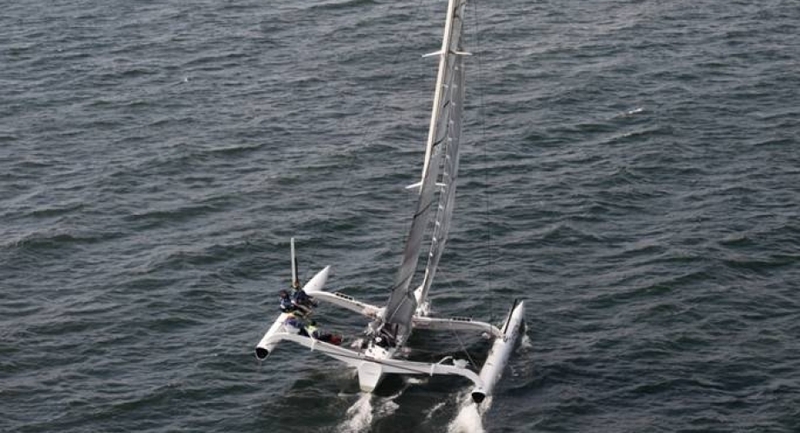 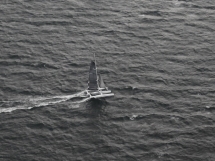 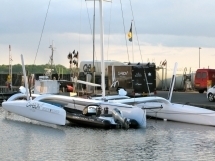 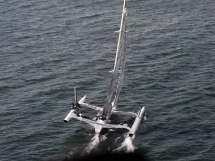 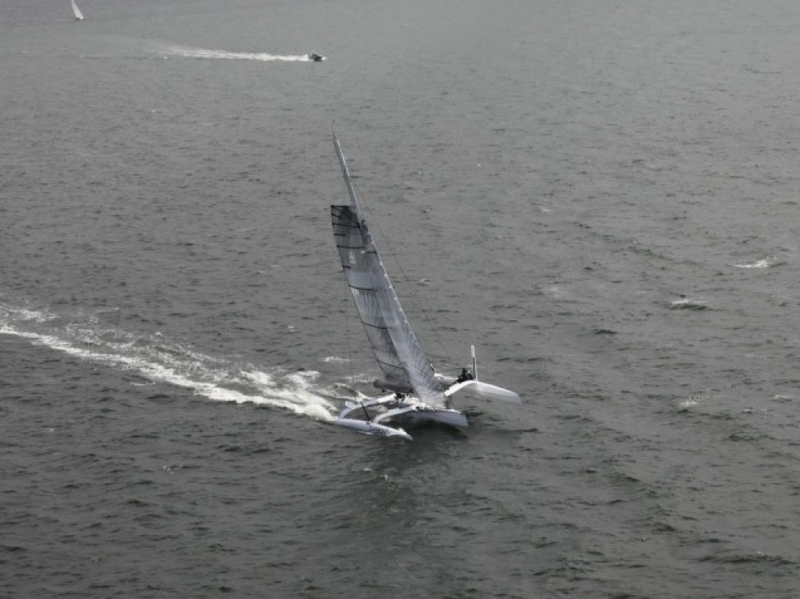 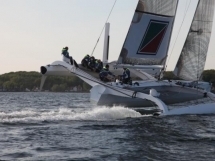 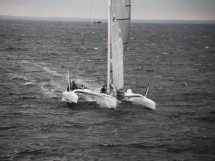 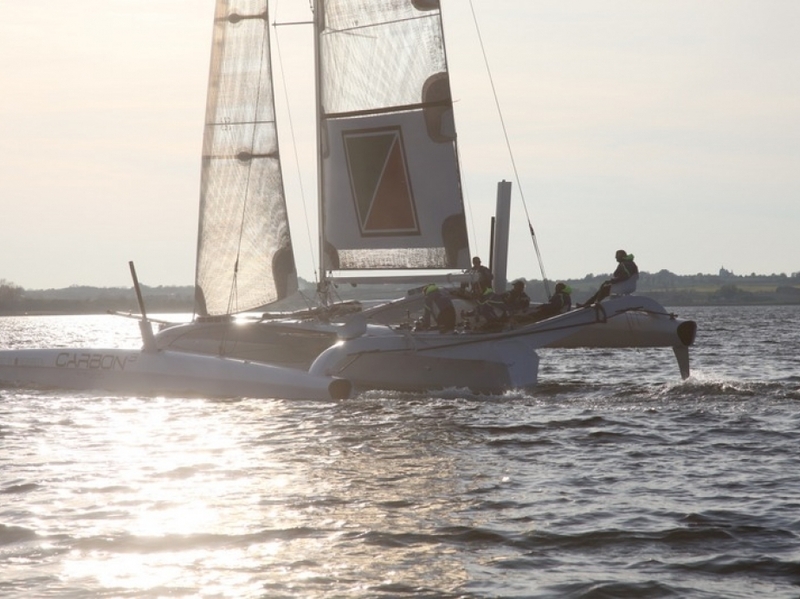 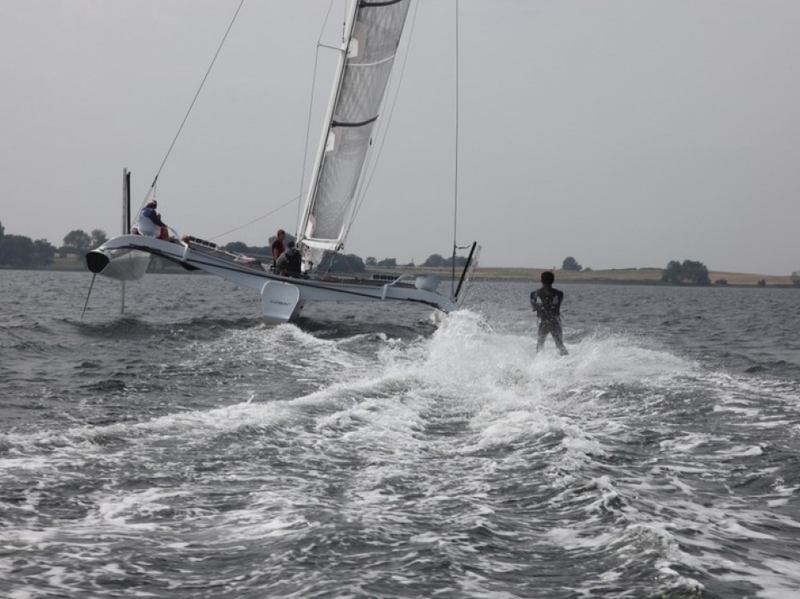 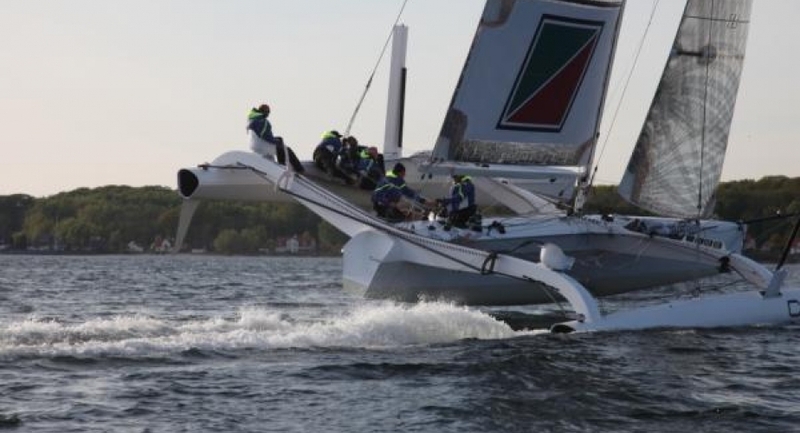 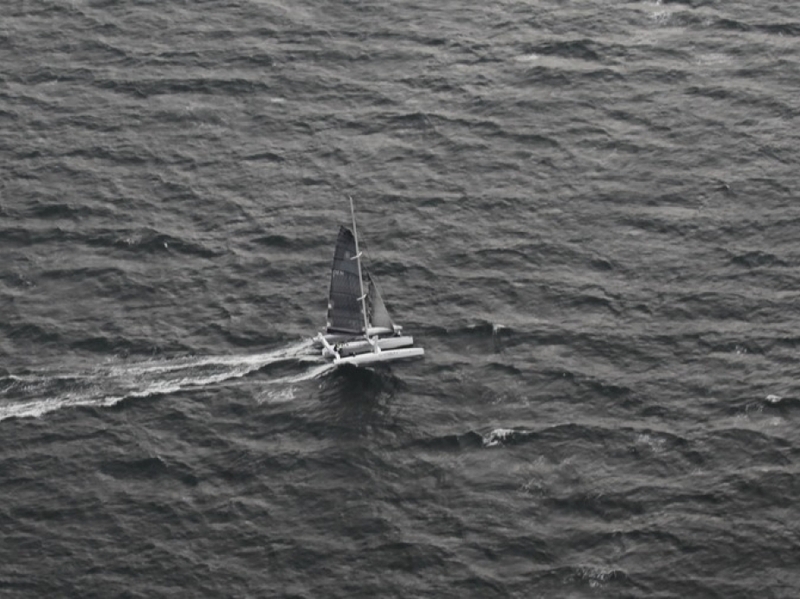 The trimaran consists of two floats and a middlefloat connecting the two. 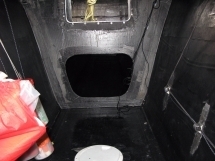 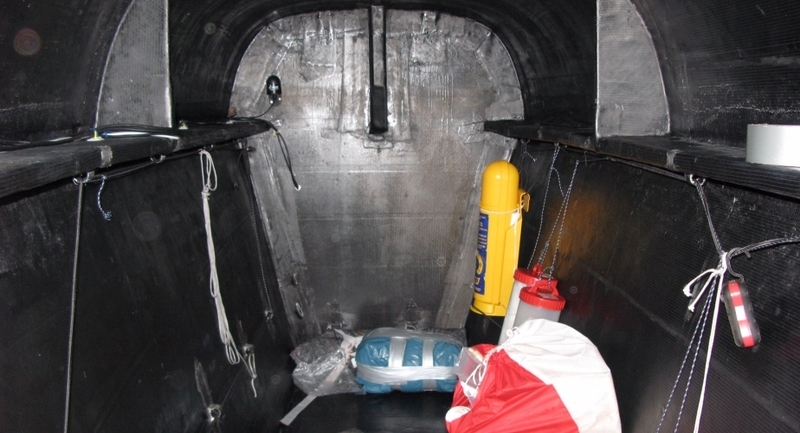 Inside the middlefloat there is room for some provisions. 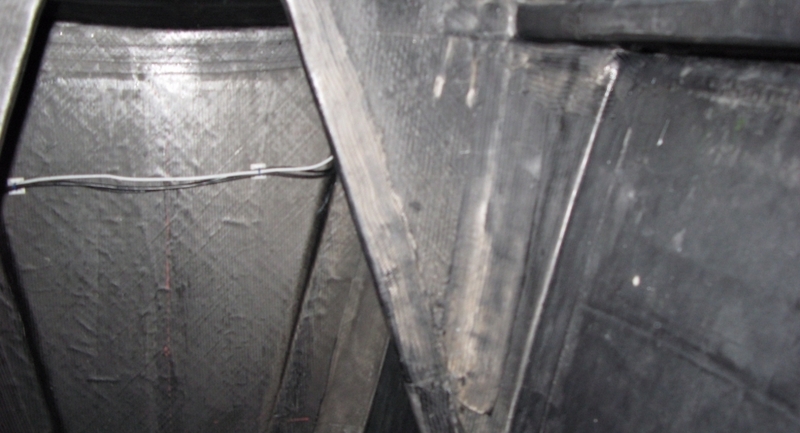 A trampoline net is suspended between the two main floats. 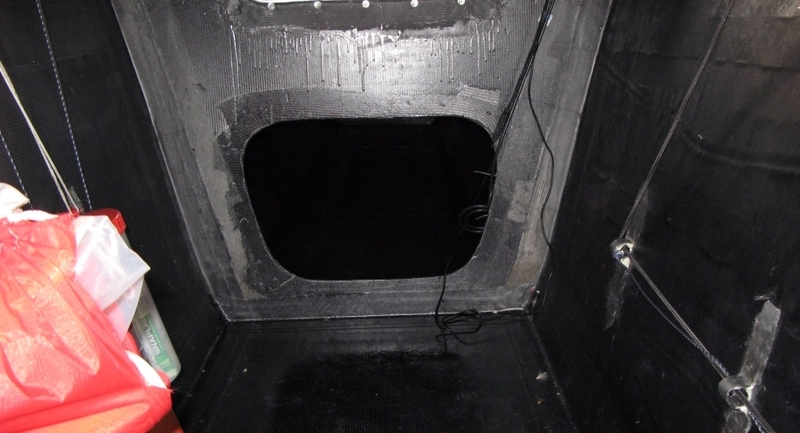 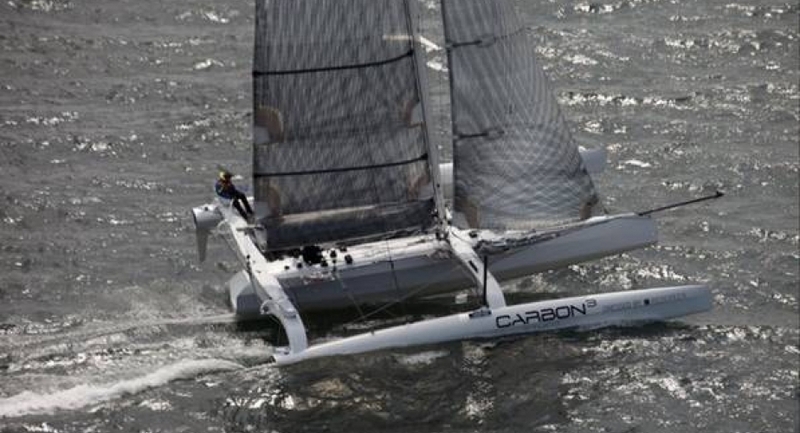 Because the Carbon3 was designed first and for most for racing this is where the crew is during sailing and not in the hull. 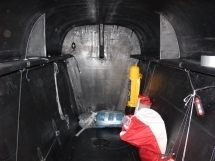 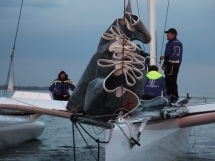 The displacement of 2052 kg is without crew. 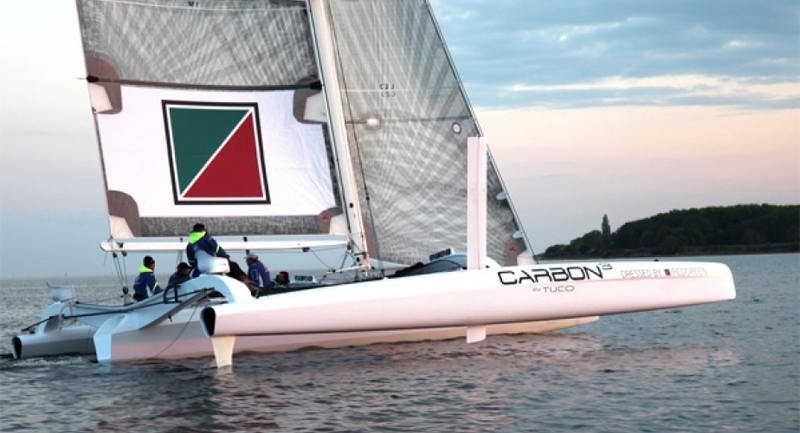 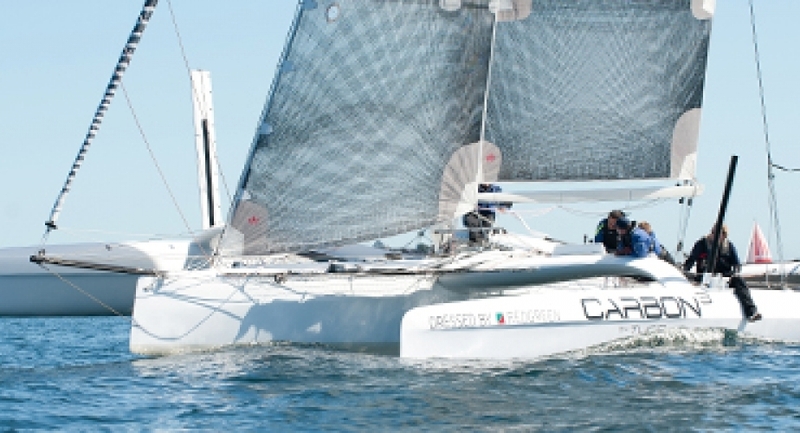 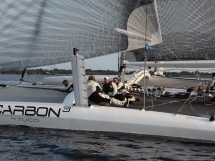 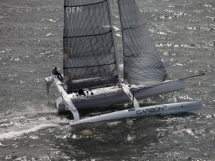 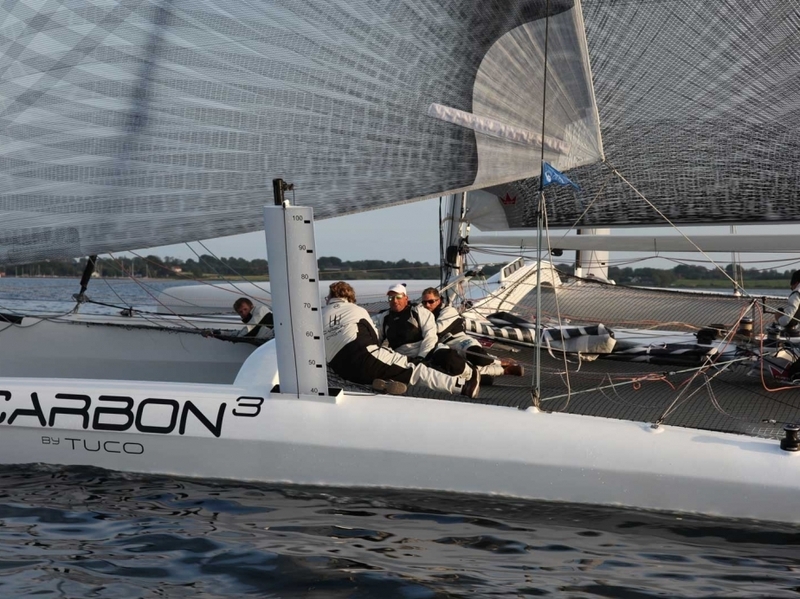 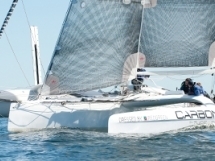 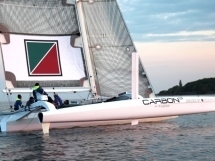 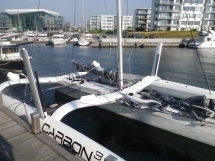 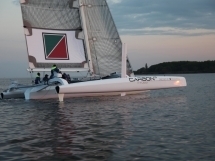 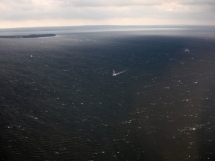 - Be aware Carbon3 is true offshore boat capable of handling such, compared to Extreme 40 that are pure inshore boats. 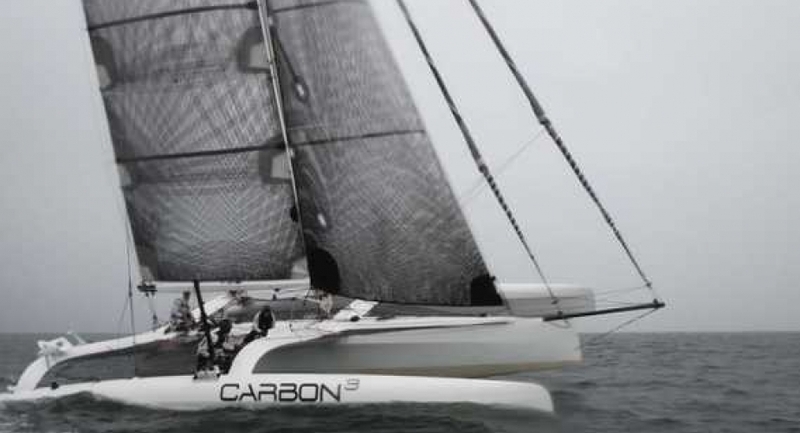 The Carbon3 is built to the design weights of the Nigel Irens office. 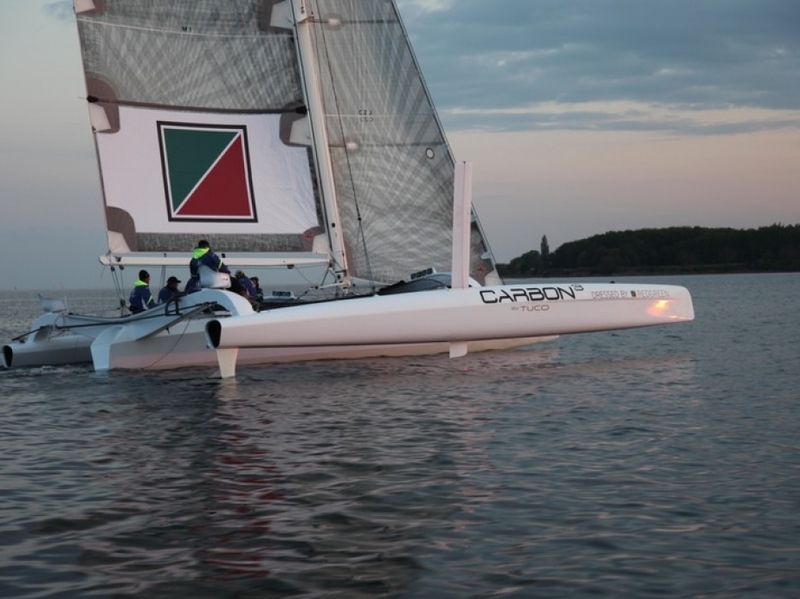 Please note as well the beam of the boat compared to the Extreme 40, it is the beam that loads up the boat and therefore requires much extra structure then the more narrow opponents. 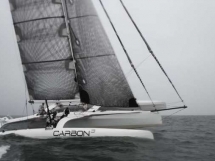 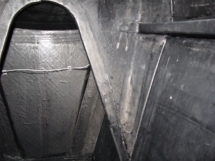 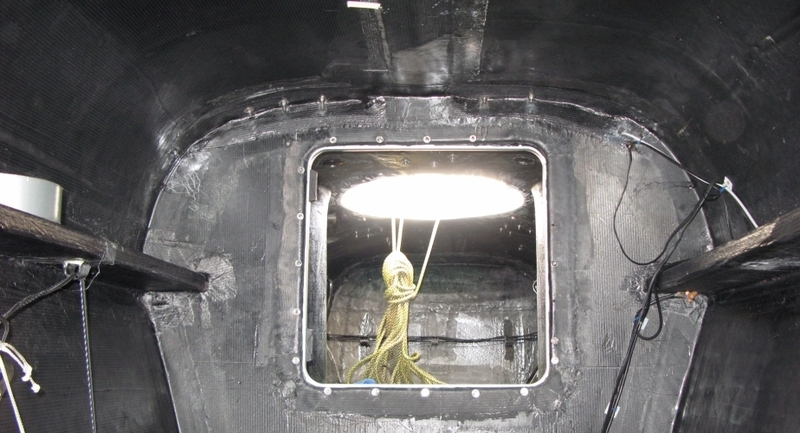 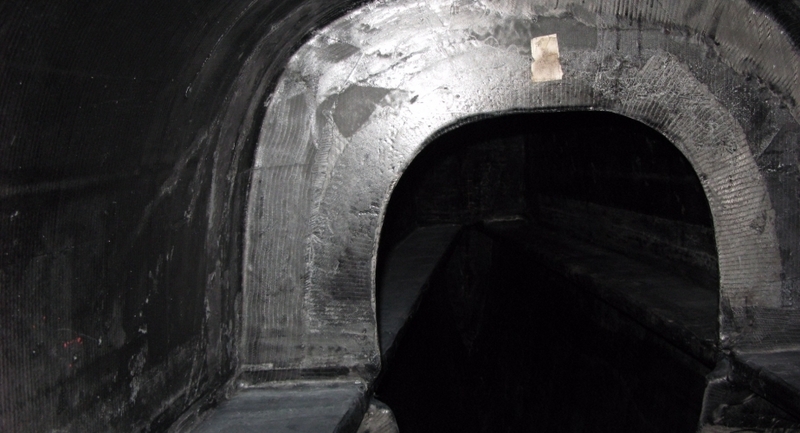 Rotating and canting carbon wing mast. 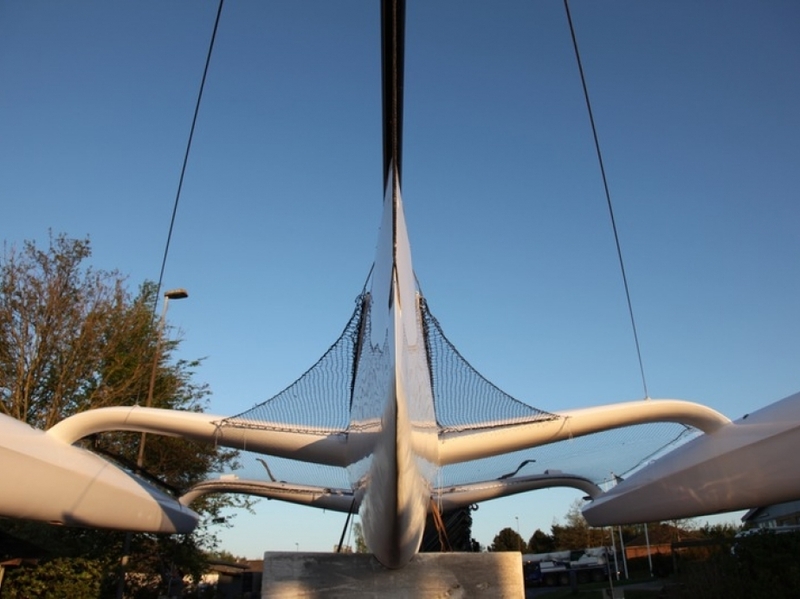 Running rigging good and race ready, alle stored inside in the teams service trailer inside shipyard. 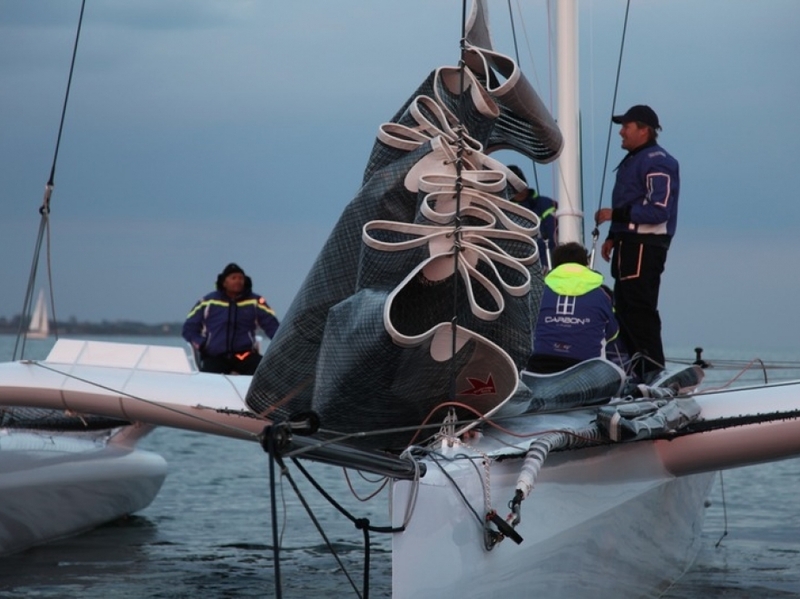 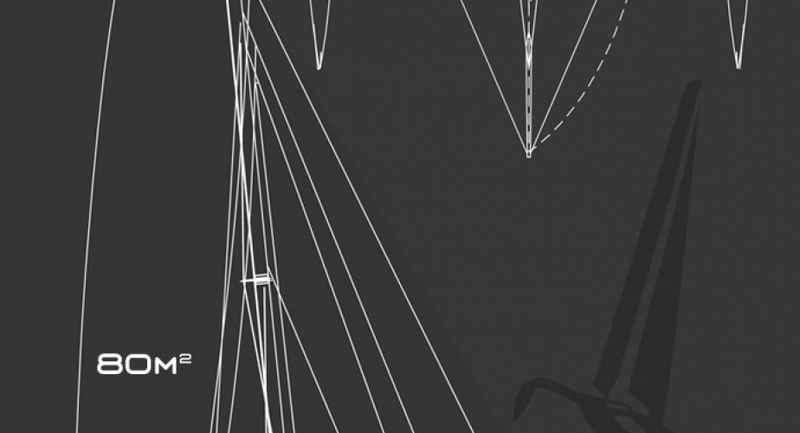 6) Code zero and Gennaker on furling cables, with halyard locks and downhaul, set from bowsprit. 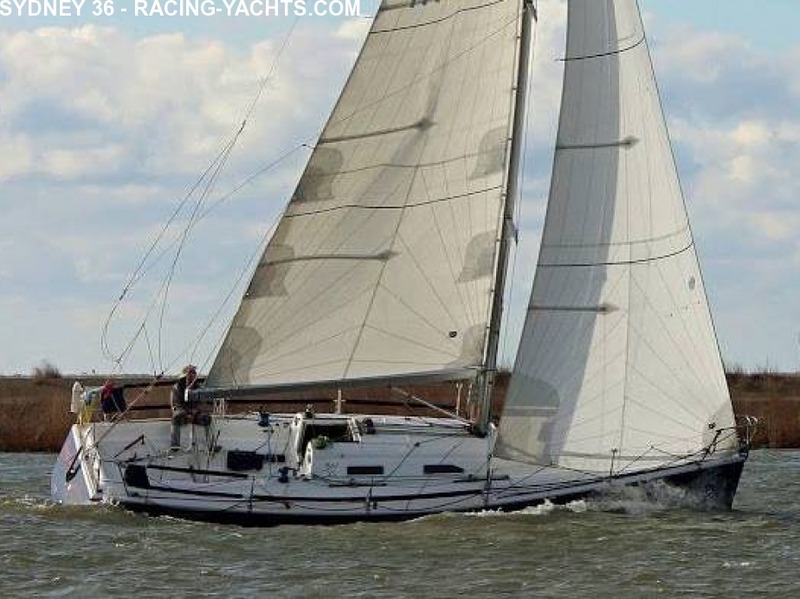 7) 100% "Solent" Jib and Staysail for upwind Mainsail with reef locks in boom.